Hamas has presented a new political charter accepting the 1967 borders for the formation of a Palestinian state without recognizing Israel. It comes two days before Palestinian Authority President Mahmoud Abbas is to meet with President Donald Trump in Washington. 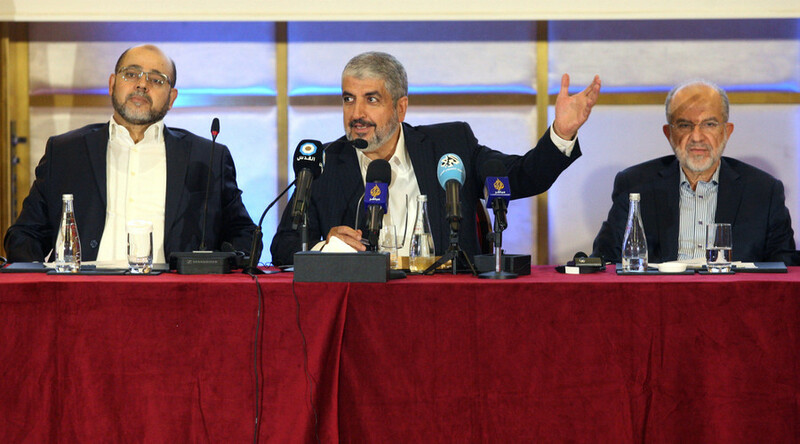 Hamas leader Khaled Meshal made the announcement in a press conference in Doha Monday. “Hamas advocates the liberation of all of Palestine but is ready to support the state on 1967 borders without recognising Israel or ceding any rights,” he said. Hamas “considers the establishment of a fully sovereign and independent Palestinian state, with Jerusalem as its capital along the lines of 4 June 1967, with the return of the refugees and the displaced to their homes from which they were expelled, to be a formula of national consensus,” the document states. The 1967 borders refer to the lines drawn out in an 1949 armistice, before the 1967 Six Day War which saw Israel capture the West Bank and East Jerusalem from Jordan and the Gaza Strip from Egypt. Hamas’ original charter in 1988 called for the reclaiming of all of Mandate Palestine, which includes present-day Israel. The PA, which controls the West Bank, supports a Palestinian state within the 1967 borders. Hamas controls the Gaza Strip. It has been classified a terrorist organization by the US. The European Union has moved towards removing the group from its terrorism list. The new document states that Hamas does not seek war with the Israeli people, just the Zionism which is behind the occupation of Palestine. “Hamas affirms that its conflict is with the Zionist project not with the Jews because of their religion,” the document reads. “Hamas does not wage a struggle against the Jews because they are Jewish but wages a struggle against the Zionists who occupy Palestine. Yet, it is the Zionists who constantly identify Judaism and the Jews with their own colonial project and illegal entity”. Trump and Abbas are meanwhile set to meet in Washington Wednesday, with the president also saying he may visit Israel this month. Trump has voiced a desire to negotiate a peace deal between Israelis and Palestinians, but later voiced support for moving the US embassy in Israel from Tel Aviv to Jerusalem, and said he would be happy with a two state or a one state solution. "The day Hamas stops digging tunnels and diverts its resources to civilian infrastructure and stop educating children to hate Israelis, that would be real change," a statement from Netanyahu’s office read Monday. The charter also distances Hamas from the Muslim Brotherhood founded in Egypt, which it was originally linked to, which could signal a potential warming of relations between Hamas and Egypt. The Egyptian president, Abdel al-Sisi, has cracked down on the Brotherhood since taking power in 2013.